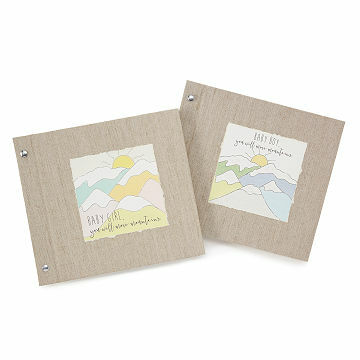 Remember every big and little step you and your little one will share with this sweet memory book. Remember first haircuts, first full nights of sleep, and all the little memories that come in the first five years with this sweet memory book, featuring majestic mountains on the cover. Tied with an organza bow and highlighted by colorful, illustrated backdrops, this prompt book offers space to record special moments, along with envelopes to stow locks of hair and their hospital ID bracelet. From the day they were born to their first day of school, this keepsake is a beautiful way to share all the memories in between. Handmade by Becky Santolamazza in San Diego, California. My motto is simple… do what you love & love what you do! That is what motivated me to turn my dream of working from home into reality back in 2002 and I am happy to say it is still true today! My design style is unique…add a creative & artistic touch to traditional products to turn them into amazing! I combine my original designs and drawings with natural materials and just a little bit of sparkle to create beautiful & unique keepsakes for you to treasure…all handmade with love! My inspiration is everywhere…incredible colors & textures of nature, beautiful papers & fonts, inspirational quotes & sayings….endless things. I try to see the beauty in the everyday….everyday! My blessings are countless…devoted husband, four beautiful children and a flexible schedule. Each day after getting my family on their way, reading my Bible, and going on my daily run, I am blessed to design, create, and pack up beautiful creations for you to enjoy! Amazing... Beautiful, unique, and handmade! This baby book is really beautiful, but there is hardly any space to write anything. There are no pages to do monthly updates for the first year either. No space to write for 1st holidays, only space for a small picture for each, which is disappointing. There is a page dedicated to each age from 1-5, but no monthly updates for the first year. The closest is a page dedicated to vaccines and weights/heights. My other son's "cheap" baby book is laid out much nicer and has plenty of room for writing and adding in pictures! For the price of this (it's expensive! ) I expect much more. I'm going to have to hey another book so I can actually write about his first year. Purchase Before Baby is Born! I have a 9-month-old, and have been dutifully taking pictures of all of his "firsts" and monthly celebrations. I thought it would be fun to use a pre-created book to pop the pictures into and make notes. The drawback - I wasn't planning ahead to use the book, so I've missed entire pages/holidays, and haven't taken note of some of the things he's doing at particular points throughout the year. There's a whole page dedicated to hand prints/foot prints, but we had a NICU baby, and never got those cute imprints. So it would be an entirely empty page. I ended up returning the book. It's a wonderful book! I just wish I had it BEFORE the baby arrived so I could enjoy filling it up. I'm so pleased with this item and will be ordering the school book as well. Folded pages for storage between if needed (locket of hair, extra pics...) Heavy pages feel expensive and cover art is just sumptuous. WORTH EVERY CENT.